"A commercial lease in which a tenant rents a property with an unfinished interior to which he or she will finish construction and make improvements. The rented property is an unfinished "shell" of a building, often a unit in a new shopping center, where the tenant must complete construction and add any necessary furniture, fixtures and equipment (FFE)." Although shell space is often marketed as a trendy way to appear hip and save a few bucks, offices sans air-conditioning featuring exposed ventilation are actually more traditional in style than millennial. Nowadays, when Hollywood portrays a startup, we see bright white walls and long biergarten tables littered with MacBooks and someone riding a bike. There are no walls, no offices, and plenty of natural light. In the real world, startups don’t have studio budgets and most don’t have money for intricate interior design or white leather furniture. Back in the day, herding workers together into a bullpen layout was the norm at large companies until cubicles were introduced to provide privacy. These divisions were seen as a luxury and a great way to cut down on ambient noise. Now, they have become the prototypical symbol of the unmotivated, paper-pushing employee, and the vintage open space layout is back in style. While it's only natural that younger companies will want to save money; that doesn’t mean your organization should settle for a space that isn’t completely renovated or furnished. This type of lease should only be entered with a full understanding of exactly what you are accepting responsibility for: including building permits, OSHA and ADA compliance, etc. If you do not carefully review the lease terms, you could end up in a situation where you spend far more than you save. 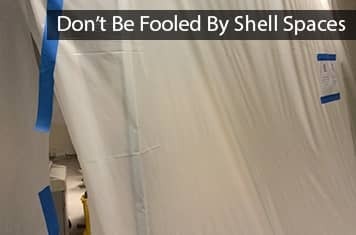 Shell space isn’t for everyone and its hip aesthetic appeal can more often than not actually be a hindrance to your employee’s productivity. Collaborative work areas are great but a loud conversation across from your desk and a lack of privacy can be deadly for deadlines. 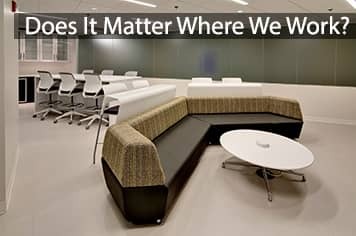 A combination of open space and private areas is much more ideal for overall productivity. Secondly, there’s the logistics to consider. 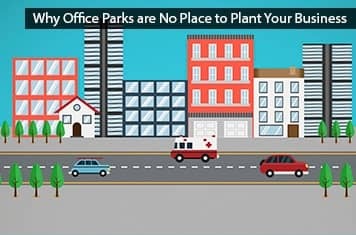 Office space maintenance, phone and Internet contracts, receptionist service, mail service, a stocked kitchen, and the day-to-day of running an office will cost you either time or a full-time employee. That’s where shared office space comes in. Consisting of workspaces that are customizable to your needs and your budget (while still granting autonomy over your business and personnel). With technologically equipped suites, live reception service and a professional support staff, shared office space is the "new hire" guaranteed to benefit your business and your bottom line.